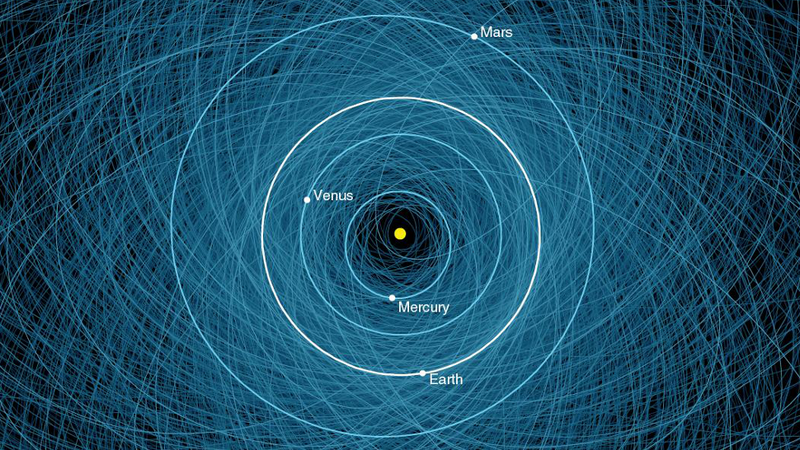 NASA has put together an image showing the orbits of all known Potentially Hazardous Asteroids (PHAs) currently threatening Earth. That's 1,400 in total — making this map uncomfortably busy. To qualify as a PHA, an asteroid needs to be fairly large — at least 460 feet (140 meters) in size — and follow orbits that pass close to the Earth's orbit — within 4.7 million miles (7.5 million kilometers). But a PHA is not necessarily on a collision course with Earth. And in fact, none of these PHAs is considered a threat for the next 100 years. But by continuing to observe and track these asteroids, NASA hopes to refine their orbits so that they can make more precise predictions in the future. To keep track of the most dangerous near Earth objects (NEOs), NASA has set up a Sentry Risk Table that works according to the Torino Scale. The most dangerous object that we know of is 2007 VK184, which gets a designation of 1 on the scale (out of 10); a Torino scale rating of 1 is a routine discovery in which an NEO will pass near the Earth but poses no unusual level of danger. An interesting point about the orbits is how so many of them are tucked inside the orbit of Jupiter, with only a few shooting beyond to the outer Solar System. That makes Jupiter a bit of a two-faced friend. On the one hand, having a giant planet in the neighborhood is great because in the early days of the Solar System it swept up all the cosmic debris that could have made life on Earth very unpleasant and very short. Unfortunately, its gravitational pull also has a habit of knocking asteroids out of the asteroid belt or hooking comets into the inner Solar System like a carnival visitor shying balls at milk bottles.